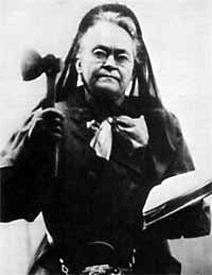 Historic People of Kansas - Last Name starts with "N"
Historic People of Kansas - "N-O"
Carrie Nation (1846-1911) - Temperance reformer, author and lecturer, Nation was born in Kentucky as Carrie Moore in 1846. Her first marriage was with a Dr. Gloyd, who died from delirium tremens, and her unhappy experience as his wife led her to become an enthusiastic advocate of prohibition. Some time after the death of her first husband she became the wife of David Nation, a lawyer and editor, who was in sympathy with her views on the liquor traffic. After a living for several years in Texas, they moved to Wichita, Kansas. Nation came to public notice in the winter of 1900-01 by her radical efforts and unusual methods of breaking up saloons. The prohibitory amendment to the Kansas Constitution had been in effect for nearly 20 years, yet intoxicating liquors were sold in a number of places in defiance of law. On December 27, 1900 she went into the Carey Hotel at Wichita and demolished the mirrors, glassware, and other items in the room where liquor was sold. She was arrested and remained in jail for several days, when she was released on bond, and almost immediately afterward broke up the furniture and emptied the liquor in two more saloons. Late in January, 1901, Nation visited Topeka, where she had a spirited interview with Governor William E. Stanley, whom she openly denounced for his failure to enforce the prohibitory laws. Associating with her were a few other women and she issued a warning to the saloon keepers of Topeka, but they paid no attention to it, and on February 5th, accompanied by the other women, she wrecked two places where liquor was sold. She was arrested and held for a short time, but was released and then returned home. A mass meeting was held at the Topeka auditorium on Sunday, February 10, to demand the enforcement of the laws. On the 18th, Nation and about 100 women raided all the saloons they could find in Topeka. They were arrested, tried and convicted for willful destruction of property, but by this time "Carrie Nation's hatchet" was almost as widely known as the historic hatchet with which George Washington cut down his father's cherry tree. Notwithstanding the decree of the Topeka court, Nation made a tour of Kansas towns, leaving in her wake broken furniture and wasted liquor bottles and beer barrels. She then began the publication at Topeka of a temperance paper called the Smasher's Mail. She also wrote several books which reached a sale of 50,000 or more, and later went upon the lecture platform. She finally got into litigation with a lecture bureau, which caused her a nervous break down, and in January, 1911, she was taken to a sanitarium at Leavenworth, Kansas, where she died of paresis on June 9, 1911. The day following her death the Topeka State Journal said: "She was something of a zealot to be sure, a crank, if you will, on the use and sale of liquor and tobacco. But it is an undeniable fact that she opened the eyes of Kansans in 1901 to the truth that their prohibition law was being almost wholly ignored. Her joint-smashing crusade was the beginning of law enforcement in this state which has meant so much to Kansas. Her services to the state, therefore, have been of no small proportions. Her services to tottering humanity were also large. She made much money on her lecture tours in this and other lands, but the greater part of it she devoted to helping unfortunates on their way. Carrie Nation is entitled to a chapter in the history of Kansas when the time comes for it to be written and this chapter will show that her life was worth while, and of value to her state. "One of Nation's efforts in behalf of suffering humanity was the founding of a home for drunkards' wives at Kansas City, Kansas, and it is said that while in New York City on one of her lecture tours she created a sensation by publicly demanding that the occupants of the Vanderbilt box at the Madison Square Garden horse show contribute money for the support of the institution. Old Crow - A Crow Indian, who was allegedly one of the members of the Dull Knife band of Cheyenne, which left the reservation in Indian Territory and made the memorable raid across Kansas in September and October, 1878, killing 32 citizens and destroying much property. They were pursued, several were captured and confined at Fort Robinson, Nebraska for some time, when their wives succeeded in smuggling in to them a number of guns, which were used on the morning of January 21, 1879, in making a dash for liberty. Captain Wessells, at the head of a squad of troops, immediately gave chase and the next day fought a desperate battle in which the Indians were almost entirely exterminated with only seven men and 16 women and children surviving. Old Crow and six of his brother warriors were taken to Fort Leavenworth and later to Dodge City, their trial being set for June 24, 1879, in the District Court of Ford County, the charge against them being murder. A change of venue was asked for by the defense which was granted, the case being sent to the District Court of Douglas County for trial at the succeeding October term, at which time all the Indians were liberated. Army officers acquainted with Old Crow said that he had been employed by the government as a scout and had proven faithful, valuable, trust worthy and bore a good reputation. They said he belonged to the Crow tribe instead of the Cheyenne and could have had no hand in the depredations of the latter in Kansas the previous year. He claimed to be a Sioux and is said to have been an Indian of more than ordinary intelligence. Thomas A. Osborn (1836-1898) - The sixth governor of Kansas from 1873 to 1877, Osborn was born at Meadville, Pennsylvania on October 26, 1836. During his boyhood he attended public schools and at the age of 15 entered a printing office and learned the trade. While serving his apprenticeship he saved his money, entered Allegheny College, and paid his own way through. 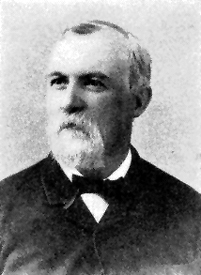 In 1856 he began the study of law with Judge Derrickson of Meadville and the following year he moved to Michigan, where he was admitted to the bar. In November, 1857, he came to Lawrence, Kansas, where he found employment with the Herald of Freedom as typesetter, assistant foreman and temporary editor. He remained with the paper until in March, 1858, when he began the practice of law at Elwood, Doniphan County. Although but a few months past his majority, he was an ardent free-state man, and soon after locating at Elwood he became an active factor in shaping the political destinies of Doniphan County. On December 6, 1859, he was elected state senator from the county to the first state legislature, which met in March, 1861. At the second session of this legislature, in 1861, Mr. Osborn was elected president of the senate over John J. Ingalls, and while holding this position he presided over the impeachment trials of the governor, secretary of state and auditor. In November, 1862, he was elected Lieutenant-Governor on the Republican ticket, and in April, 1864, he was appointed by President Lincoln, United States Marshal for the District of Kansas. He then moved to the city of Leavenworth. When the difference of opinion arose between President Johnson and Congress in 1867 Osborn advocated the Congressional policy of reconstruction and was removed from the marshalship, but his removal added to his popularity. In 1868 he was a member of the Republican State Central Committee; was elected governor in 1872, and was re-elected in 1874 for the term ending in January, 1877. In 1875 he received a number of votes for United States Senator, but Preston B. Plumb, with whom he had worked on the Herald of Freedom, was elected. On May 31, 1877, he was commissioned by President Hayes Envoy Extraordinary and Minister Plenipotentiary to Chili, and in June he started for Santiago. In 1881 he was promoted to the Brazilian Mission, but before leaving Chili he received the public thanks of the government for his work in settling the question of boundary between that country and the Argentine Republic. Upon his return home from South America, Osborn became interested in various business enterprises including banking, railroad construction, and real estate. As early as May, 1866, he had been one of the North Kansas Railroad Company, and was a director of the Atchison, Topeka & Santa Fe from the time the company was organized until his death, which occurred at Meadville, Pennsylvania on February 4, 1898. He had been to New York to attend a meeting of the railroad directors, and had stopped at Meadville for a short visit with some of his old boyhood friends, when he was attacked by a hemorrhage and died in a few hours. His remains were brought to Topeka and laid to rest by the side of his wife, who had died some years before. John Grant Otis (1838-1916) - Lawyer and member of Congress, Otis was born near Danby, Rutland County, Vermont on February 10, 1838. He received his early education in public schools and then took an academic course at Burr Seminary. Subsequently he attended Williams College, at Williamstown, Massachusetts for one year and Harvard Law School one year. In the spring of 1859 he was admitted to the bar of his native county. The same year he came to Kansas and settled at Topeka, where he took an active part in recruiting the first regiment of Kansas Colored Infantry in 1862. At the time of the Price Raid in 1864 he was a member of the Second Kansas Infantry and took part in all the movements of his regiment. At the close of the war he engaged in the dairy business near Topeka. He was always interested in questions pertaining to farming; became a member of the Grange, the Farmers' Alliance and Industrial Union; served as state agent for the Grange from 1873 to 1875, and state lecturer from 1889 to 1891. In 1900 he became the candidate of the People's Party and was elected to Congress on that ticket, serving one term. He was an unsuccessful candidate for re-nomination in 1892. He then engaged in his former business pursuits until his death in Topeka, Kansas on February 22, 1916. He was interred in Topeka Cemetery. Compiled and edited by Kathy Weiser/Legends of Kansas, updated March, 2017. About the Article: The majority of this historic text was published in Kansas: A Cyclopedia of State History, Volume I; edited by Frank W. Blackmar, A.M. Ph. D.; Standard Publishing Company, Chicago, IL 1912. However, the text that appears on these pages is not verbatim, as additions, updates, and editing have occurred. Native American Inspired Healing - From all natural remedies to, healing stones, medicine bags, arrowheads, books and art, these products, inspired by Native American tribal practices, incorporate mind and body techniques that can treat almost any condition whether it is psychological or physical.